Focus: Involves springing off the ground using the thrust from both feet. One foot, invariably that on the more dexterous side of the body, is then used to kick the target. 1. Bend both your knees in preparation for the jump. 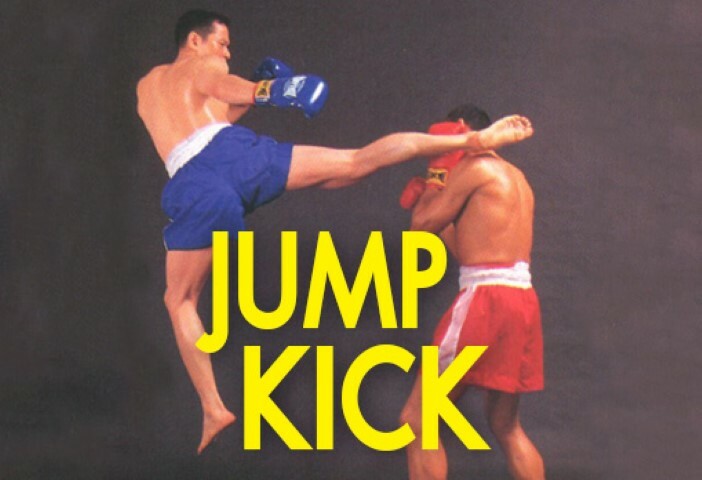 Variations: Although technically any kicking technique can be used in combination with The Jump Kick, in practice The Round Kick is almost always used. Occasionally, The Down Round Kick is coupled with The Jump Kick. 2. Using both feet to obtain the required leverage, spring into the air, twisting your right hip forwards, and extending your right leg, bent at the knee, out to the side, with the lower leg in the rear. This can be thought of as a mid-air version of the preparation for The Round Kick.